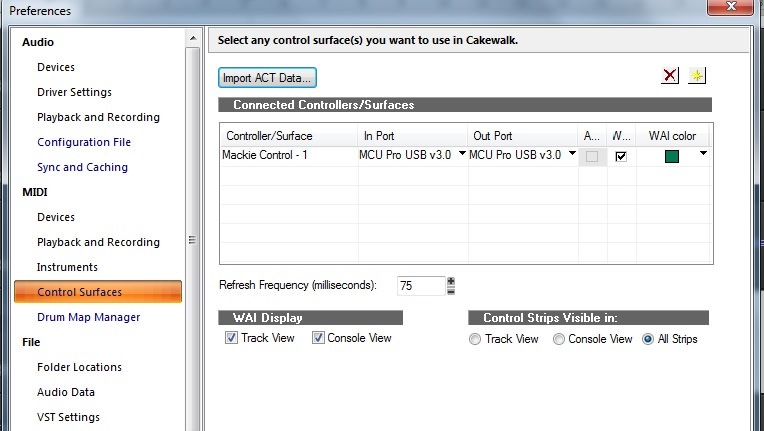 Home » [Cakewalk Products] » SONAR » Cant get Mackie MCU working ?? AnsweredCant get Mackie MCU working ?? Cant get Mackie MCU working ?? Cakewalk (latest update) and MCU have stopped communicating - I've tried removing all MIDI devices and resetting control surfaces + numerous restarts - no joy! Any suggestions / tips ? Sonar & CbB share the same "Shared Surfaces" directory, so if it's working in Sonar, it should work in CbB. 1. Try comparing your "MIDI->Playback and Recording" settings between Sonar & CbB, and see if anything is unchecked in CbB that is enabled in Sonar. 2. Select "Mackie Control - 1" from the Utilities menu, and click the "Configure Layout" button. Make sure it's set to control tracks 1 through 8. All working now many thanks! !